11 B None No Power Seat 11 B is a standard Economy Class seat. All B seats may have limited legroom and storage space underneath the seat due to the presence of an entertainment equipment box under the seat in front. 11 J None No Power Seat 11 J is a standard Economy Class seat. All J seats may have limited legroom and storage space underneath the seat due to the presence of an entertainment equipment box under the seat in front. 12 B None No Power Seat 12 B is a standard Economy Class seat. All B seats may have limited legroom and storage space underneath the seat due to the presence of an entertainment equipment box under the seat in front. 12 J None No Power Seat 12 J is a standard Economy Class seat. All J seats may have limited legroom and storage space underneath the seat due to the presence of an entertainment equipment box under the seat in front. 14 B None No Power Seat 14 B is a standard Economy Class seat. All B seats may have limited legroom and storage space underneath the seat due to the presence of an entertainment equipment box under the seat in front. 14 J None No Power Seat 14 J is a standard Economy Class seat. All J seats may have limited legroom and storage space underneath the seat due to the presence of an entertainment equipment box under the seat in front. 15 B None No Power Seat 15 B is a standard Economy Class seat. All B seats may have limited legroom and storage space underneath the seat due to the presence of an entertainment equipment box under the seat in front. 15 J None No Power Seat 15 J is a standard Economy Class seat. All J seats may have limited legroom and storage space underneath the seat due to the presence of an entertainment equipment box under the seat in front. 16 A None No Power Seat 16 A is an Economy Class seat that is missing a window. 16 B None No Power Seat 16 B is a standard Economy Class seat. All B seats may have limited legroom and storage space underneath the seat due to the presence of an entertainment equipment box under the seat in front. 16 J None No Power Seat 16 J is a standard Economy Class seat. All J seats may have limited legroom and storage space underneath the seat due to the presence of an entertainment equipment box under the seat in front. 16 K None No Power Seat 16 K is an Economy Class seat that is missing a window. 29 B None No Power Seat 29 B is a standard Economy Class seat. All B seats may have limited legroom and storage space underneath the seat due to the presence of an entertainment equipment box under the seat in front. 29 J None No Power Seat 29 J is a standard Economy Class seat. All J seats may have limited legroom and storage space underneath the seat due to the presence of an entertainment equipment box under the seat in front. 30 A None No Power Seat 30 A is an Economy Class seat that is missing a window. Also, this seat may not recline due to the exit row behind. 30 B None No Power Seat 30 B is an Economy Class seat that may have limited recline due to the exit row behind. All B seats may have limited legroom and storage space underneath the seat due to the presence of an entertainment equipment box under the seat in front. 30 D None No Power Seat 30 D is an Economy Class seat that may have limited recline due to the exit row behind. All D seats may have limited legroom and storage space underneath the seat due to the presence of an entertainment equipment box under the seat in front. 30 E None No Power Seat 30 E is an Economy Class seat that may have limited recline due to the exit row behind. 30 F None No Power Seat 30 F is an Economy Class seat that may have limited recline due to the exit row behind. 30 G None No Power Seat 30 G is an Economy Class seat that may have limited recline due to the exit row behind. All G seats may have limited legroom and storage space underneath the seat due to the presence of an entertainment equipment box under the seat in front. 30 J None No Power Seat 30 J is an Economy Class seat that may have limited recline due to the exit row behind. All J seats may have limited legroom and storage space underneath the seat due to the presence of an entertainment equipment box under the seat in front. 30 K None No Power Seat 30 K is an Economy Class seat that is missing a window. Also, this seat may not recline due to the exit row behind. 31 A None No Power Seat 31 A is an Economy Class Exit Row seat that has extra legroom. The tray table is in the armrest, making the armrest immovable and slightly reducing seat width. There is no floor storage for this seat during takeoff and landing. 31 B None No Power Seat 31 B is an Economy Class Exit Row seat that has extra legroom. The tray table is in the armrest, making the armrest immovable and slightly reducing seat width. There is no floor storage for this seat during takeoff and landing. 31 D None No Power Seat 31 D is an Economy Class Exit Row seat that has limited legroom. The tray table is in the armrest, making the armrest immovable and slightly reducing seat width. There is no floor storage for this seat during takeoff and landing. This seat is a bassinet location and passengers traveling with infants may be seated in this area. 31 E None No Power Seat 31 E is an Economy Class Exit Row seat that has limited legroom. The tray table is in the armrest, making the armrest immovable and slightly reducing seat width. There is no floor storage for this seat during takeoff and landing. This seat is a bassinet location and passengers traveling with infants may be seated in this area. 31 F None No Power Seat 31 F is an Economy Class Exit Row seat that has limited legroom. The tray table is in the armrest, making the armrest immovable and slightly reducing seat width. There is no floor storage for this seat during takeoff and landing. This seat is a bassinet location and passengers traveling with infants may be seated in this area. 31 G None No Power Seat 31 G is an Economy Class Exit Row seat that has limited legroom. The tray table is in the armrest, making the armrest immovable and slightly reducing seat width. There is no floor storage for this seat during takeoff and landing. This seat is a bassinet location and passengers traveling with infants may be seated in this area. 31 J None No Power Seat 31 J is an Economy Class Exit Row seat that has extra legroom. The tray table is in the armrest, making the armrest immovable and slightly reducing seat width. There is no floor storage for this seat during takeoff and landing. 31 K None No Power Seat 31 K is an Economy Class Exit Row seat that has extra legroom. The tray table is in the armrest, making the armrest immovable and slightly reducing seat width. There is no floor storage for this seat during takeoff and landing. 41 B None No Power Seat 41 B is a standard Economy Class seat. All B seats may have limited legroom and storage space underneath the seat due to the presence of an entertainment equipment box under the seat in front. 41 G None No Power Seat 41 G is a standard Economy Class seat. All G seats may have limited legroom and storage space underneath the seat due to the presence of an entertainment equipment box under the seat in front. 41 J None No Power Seat 41 J is a standard Economy Class seat. All J seats may have limited legroom and storage space underneath the seat due to the presence of an entertainment equipment box under the seat in front. 42 B None No Power Seat 42 B is a standard Economy Class seat. However, the seats in this area feel cramped and narrower due to the curvature of the plane. Also, the seats in this area are misaligned with those in front of them which causes neck strain when watching the personal TVs located on the back of the seats in front. All B seats may have limited legroom and storage space underneath the seat due to the presence of an entertainment equipment box under the seat in front. 42 D None No Power Seat 42 D is a standard Economy Class seat. However, this seat juts into aisle and may often be bumped by service carts or others passing by due to the awkward configuration transition from 4 to 3 seats. All D seats may have limited legroom and storage space underneath the seat due to the presence of an entertainment equipment box under the seat in front. 42 G None No Power Seat 42 G is a standard Economy Class seat. However, this seat juts into aisle and may often be bumped by service carts or others passing by due to the awkward configuration transition from 4 to 3 seats. All G seats may have limited legroom and storage space underneath the seat due to the presence of an entertainment equipment box under the seat in front. 43 B None No Power Seat 43 B is a standard Economy Class seat. However, the seats in this area feel cramped and narrower due to the curvature of the plane. Also, the seats in this area are misaligned with those in front of them which causes neck strain when watching the personal TVs located on the back of the seats in front. All B seats may have limited legroom and storage space underneath the seat due to the presence of an entertainment equipment box under the seat in front. 43 D None No Power Seat 43 D is a standard Economy Class seat. However, this seat may have restricted legroom due to the misaligned seats and the awkward configuration transition from 4 to 3 seats. While you have some extra storage space, you'll have to maneuver your legs around the extra seat anchors. The tray table is in the armrest, making the armrests immovable and slightly reducing seat width. All D seats may have limited legroom and storage space underneath the seat due to the presence of an entertainment equipment box under the seat in front. 43 E None No Power Seat 43 E is a standard Economy Class seat. However, this seat may have restricted legroom due to the misaligned seats and the awkward configuration transition from 4 to 3 seats. While you have some extra storage space, you'll have to maneuver your legs around the extra seat anchors. The tray table is in the armrest, making the armrests immovable and slightly reducing seat width. 43 F None No Power Seat 43 F is a standard Economy Class seat. However, this seat may have restricted legroom due to the misaligned seats and the awkward configuration transition from 4 to 3 seats. While you have some extra storage space, you'll have to maneuver your legs around the extra seat anchors. The tray table is in the armrest, making the armrests immovable and slightly reducing seat width. 43 J None No Power Seat 43 J is a standard Economy Class seat. However, the seats in this area feel cramped and narrower due to the curvature of the plane. Also, the seats in this area are misaligned with those in front of them which causes neck strain when watching the personal TVs located on the back of the seats in front. All J seats may have limited legroom and storage space underneath the seat due to the presence of an entertainment equipment box under the seat in front. 44 B None No Power Seat 44 B is a standard Economy Class seat. However, the seats in this area feel cramped and narrower due to the curvature of the plane. Also, the seats in this area are misaligned with those in front of them which causes neck strain when watching the personal TVs located on the back of the seats in front. The proximity to the lavatory may be bothersome. All B seats may have limited legroom and storage space underneath the seat due to the presence of an entertainment equipment box under the seat in front. 44 J None No Power Seat 44 J is a standard Economy Class seat. However, the seats in this area feel cramped and narrower due to the curvature of the plane. Also, the seats in this area are misaligned with those in front of them which causes neck strain when watching the personal TVs located on the back of the seats in front. The proximity to the lavatory may be bothersome. All J seats may have limited legroom and storage space underneath the seat due to the presence of an entertainment equipment box under the seat in front. 45 A None No Power Seat 45 A is an Economy Class seat located in the last row of the plane and may have limited recline. The proximity to the lavatory and galley may be bothersome. 45 B None No Power Seat 45 B is an Economy Class seat located in the last row of the plane and may have limited recline. The proximity to the lavatory and galley may be bothersome. All B seats may have limited legroom and storage space underneath the seat due to the presence of an entertainment equipment box under the seat in front. 45 D None No Power Seat 45 D is an Economy Class seat located in the last row of the plane and may have limited recline. The proximity to the lavatory and galley may be bothersome. All D seats may have limited legroom and storage space underneath the seat due to the presence of an entertainment equipment box under the seat in front. 45 E None No Power Seat 45 E is an Economy Class seat located in the last row of the plane and may have limited recline. The proximity to the lavatory and galley may be bothersome. 45 F None No Power Seat 45 F is an Economy Class seat located in the last row of the plane and may have limited recline. The proximity to the lavatory and galley may be bothersome. 45 J None No Power Seat 45 J is an Economy Class seat located in the last row of the plane and may have limited recline. The proximity to the lavatory and galley may be bothersome. All J seats may have limited legroom and storage space underneath the seat due to the presence of an entertainment equipment box under the seat in front. 45 K None No Power Seat 45 K is an Economy Class seat located in the last row of the plane and may have limited recline. The proximity to the lavatory and galley may be bothersome. 5 A None No Power Seat 5 A is a standard Business Class seat. However, the proximity to the lavatory and galley may be bothersome. 5 B None No Power Seat 5 B is a standard Business Class seat. However, the proximity to the lavatory and galley may be bothersome. 5 E None No Power Seat 5 E is a standard Business Class seat. However, the proximity to the lavatory and galley may be bothersome. 5 F None No Power Seat 5 F is a standard Business Class seat. However, the proximity to the lavatory and galley may be bothersome. 5 J None No Power Seat 5 J is a standard Business Class seat. However, the proximity to the lavatory and galley may be bothersome. 5 K None No Power Seat 5 K is a standard Business Class seat. However, the proximity to the lavatory and galley may be bothersome. 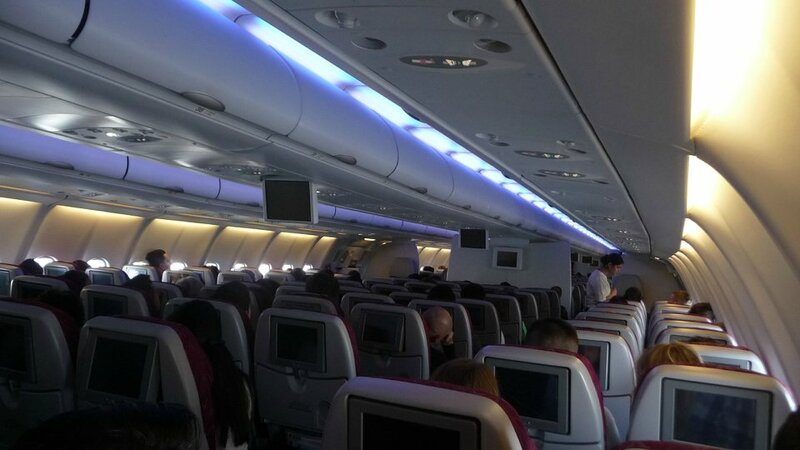 There are three different versions of the A330-300 operating in the Qatar Airways fleet. For this Version, Business Class is found from rows 1 to 5 and Economy Class begins at row 10, ending at row 45. This aircraft is used for a variety of long-haul destinations and it flies with 30 seats of Business Class and 275 seats of Economy Class. In the Economy Class, all A, D, G and K seats on the A330-300s may have limited legroom and storage space underneath the seat due to the presence of an entertainment equipment box under the seat in front. All K seats has a box on the right site at the bottum. You have only 50% space for your legs than on the other seats. Its also for raw 11, 12, 13, 14, 15, 16. After 17 I Don`t know. Never had so little leg room in a long-haul flight. I'm 190cm tall, so this was horrible. Would have expected more of Qatar. As stated by others, the seat was too my happy surprise not angle-flat, but fully flat. Biggest problem with this seat is taht there is no storage space whatsoever (except the overhead compartment). Food and other services were up to standard with Qatar's normal service, which is excellent compared to many others in the industry. It is just a pity that they do not hand out piyama's on day flights (even though everyone was sleeping on my flight due to the early departure). In addition to the entertainment box under the seat in front, this seat suffers from even further restricted leg room, due to the stowage for the tv screen for the seat in front also being in the space under the seat (row 10 is the bulkhead row, so the table and screen are in the armrests). Thus this seat has even less leg room than all other A seats, so should be considered red. The window exactly isn't perfectly beside the seat, so you have to lean forward to look outside. So if you want a comfortable view without having to adjust your posture, do not select this seat, instead choose seats behind this row. 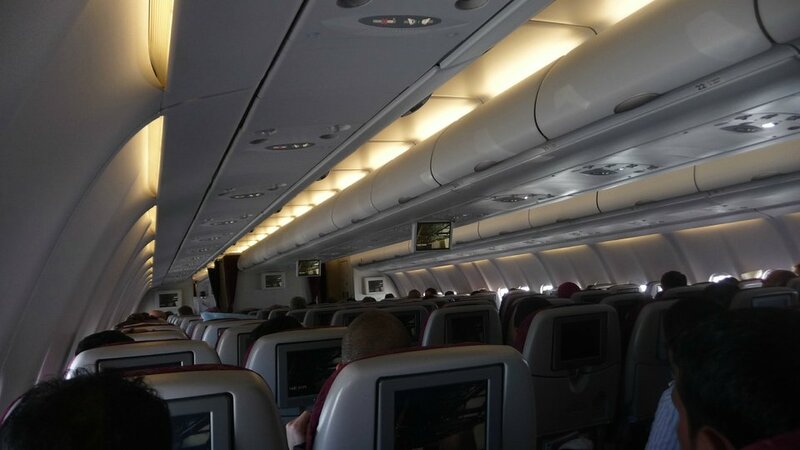 I flew today Doha-Munich and these business class seats was not 165 degree angle flat seats. They where fully 180 flatbeds of the same Diamond type that KLM uses on the747 and 777. Same seat as Jetblue Mint. A nice surprise for sure. Seat size for a person of 163 cm was ok, but not great if the seat in front was fully reclined. Meal on Qatar was the worst meal on any comparable Economy flight with other airlines. No window, no leg room because of box under seat in front. Not much recline. Felt very boxed in. Manchester to Doha. Awful seat. No room for left leg due to entertainment box. Less leg room than easy jet flight due to this. Awful 8 hour journey to Jakarta. Very narrow seat with limited leg room due to the bulkhead. Not a good seat for a long flight, just glad I was able to move elsewhere.